Whether it’s a Thanksgiving meal or a family vacation, I have always been a planner. My childhood journals are full of lists: Winter Activities (sit by fire, cross-stitch, build igloos, make paper dolls), My Halloween Candy (an inventory of my trick-or-treating bounty), Things to Do While Driving to Cedar Point (item one: make a list of the rides we should go on first). When my husband and I got married, our pastor joked from the altar that our wedding was a first for him: in two decades of performing ceremonies, I was the only bride to supply him with a script. For years I longed to change this aspect of my personality. I envied friends (like the aforementioned Tia) who effortlessly “lived in the moment” and could “take life as it comes.” Uncluttered by stray thoughts of schedules or obligations, I imagined their lives a constant sequence of slow-motion, lens-flared bliss. After years of unsuccessfully wishing myself spontaneous, I decided to embrace my list-making, itinerary-following ways. And I discovered it held a different kind of joy: the joy of anticipation. Planning takes the 90-second glee of a roller coaster and infuses it into every minute spent studying the amusement park map. It makes the first snowfall all the more magical, the flakes conjuring thoughts of fireside stitching and igloo floor plans. Holidays such as Thanksgiving are perhaps the best example, requiring menus and shopping trips and playlists and, yes, even that unflattering moment with the turkey. And when the clock hits 1:30 and your food arrives simultaneously at the platters you arranged the night before, you are given the secondary reward for the planners among us: satisfaction. 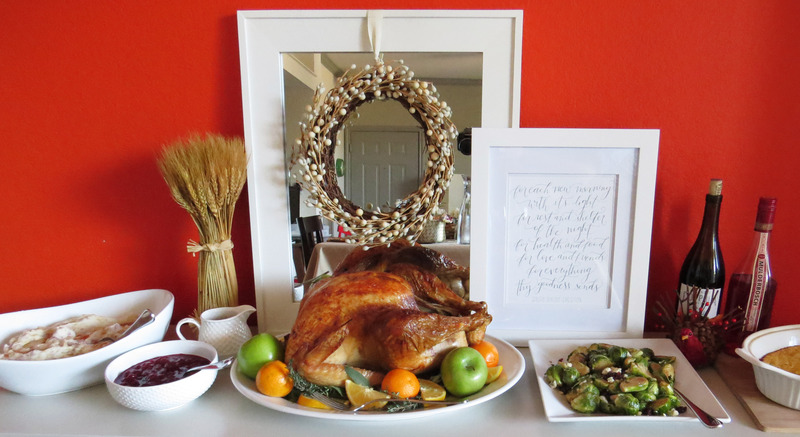 So before the living room is filled with the scent of pine needles and gingerbread, I will savor the bounty of my Thanksgiving planning one last time: the succulent turkey, the orange-flecked cranberry sauce, the meticulously-ironed cloth napkins. All inspiring a final sigh of left over joy. I am smitten with these cheerful sandwiches, first prepared by my friend Grace for a holiday pitch-in. It’s perfect fare for a crowd, since the sandwiches cook simultaneously in the oven, not one-by-one on the stove. Since this is a meal of leftovers, I didn’t specify amounts; make as many sandwiches as you want with whatever you have on hand. Preheat the oven to 400° with one rack placed in the lowest position. Place a baking sheet on the bottom rack and allow it to preheat with the oven. Meanwhile, assemble the sandwiches. Butter two slices of bread and place one, buttered-side down, on a work surface. 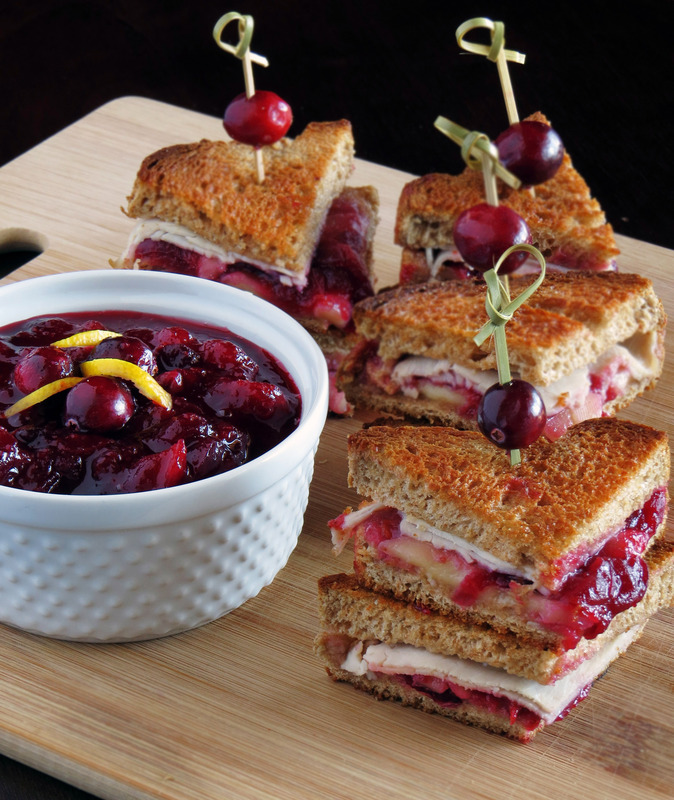 Layer with turkey, cranberry sauce, and brie. Top with another slice of bread, buttered-side up. Repeat for as many sandwiches as you need. When the bottom is nice and toasty, turn your oven to “broil” and cook another 1-3 minutes, watching the sandwiches closely to ensure they don’t burn. When the sandwiches reach that satisfying, golden-brown hue, remove from the oven and transfer to a cutting board. Slice into quarters (and, if you’re feeling fancy, garnish each wedge with a cranberry-threaded toothpick). I’ve made some incarnation of this Whole Foods recipe for the last five years. It’s so unbelievably easy, you’ll kick yourself for ever buying the canned stuff. Zest the orange and set the zest aside. Combine sugar, cranberries, and 1/2 cup water in a small (preferably non-stick) saucepan. Juice the orange and add 1/2 cup of juice to the saucepan. (If your orange yielded less juice, add some water until you wind up with 1/2 cup.) Bring mixture to a boil then reduce to a simmer. Cook ten minutes, stirring occasionally. Remove from heat and stir in orange zest. Cool completely, then transfer to an airtight container and store in the fridge. (The sauce will thicken as it cools.) The sauce may be stored in the fridge for 2+ weeks. The blog is delightful and the photos are scrumptious! Beautiful work, my friend.